Free libray in a tree! In the Dutch town Ruurlo you can find a tree. Not just any tree, but a tree with books in it. You can borrow these books, as long as you bring them back again. 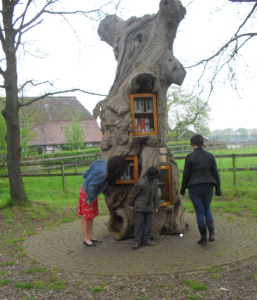 The tree is a free library. You can find it at the corner of de Batsdijk and de Vortsterkampweg in Ruurlo Netherlands. There's a picnicktable near the tree, so you can have nice family picknick if you want to.